A fun filled evening at the races with a spectacular evening concert in the informal and relaxed open-air setting of the hallowed turf of Newmarket Racecourses! 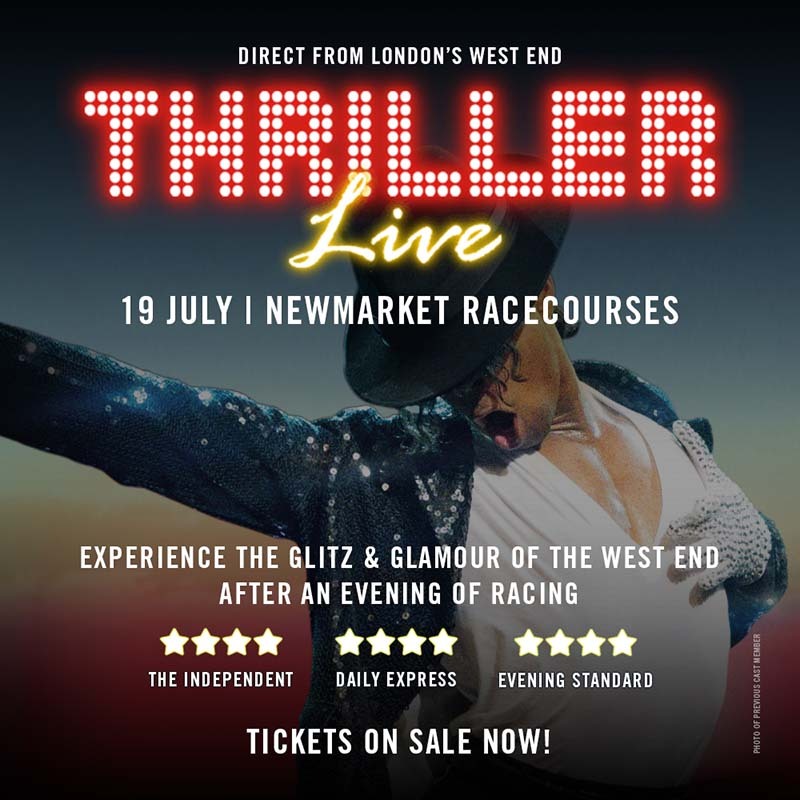 Following the success of The Jacksons in 2017, and Magic of Motown in 2018, The Jockey Club Live and Newmarket Racecourses are thrilled to announce the first show for the 2019 Newmarket Nights season; direct from London's West End - THRILLER LIVE. After opening in the Lyric Theatre in London on 2 January 2009 to rave reviews, Thriller Live has since embarked on several world tours, played over 6500 shows globally to over 5 million fans, visited over 30 countries. Taking you on an electrifying visual and audio journey through the magic of Michael’s 45 year musical history, you’ll experience over two hours of non-stop hits from pop to rock, soul to disco. Paying homage to Jackson’s legendary live performances and innovative dance moves executed with flair, precision and passion this is a show that you will never forget. Expect your favourite songs delivered by an exceptionally talented cast and band, including: I Want You Back, ABC, Can You Feel It, Off The Wall, The Way You Make Me Feel, Smooth Criminal, Beat It, Billie Jean, Dirty Diana, Bad, Rock With You, They Don’t Care About Us, Dangerous, Thriller plus many more! The ticket/s you purchase will include the racing and the concert.